A safer way to probe galaxy evolution, without the potential biases introduced through using systems with powerful active nuclei, is to use the whole galaxy population. An obvious approach, albeit one very expensive in telescope time, is to spectroscopically survey large, well-defined samples of faint galaxies, preferably selected at wavelengths which minimize the role of ongoing star formation. Until recently, with large telescopes and spectrographs which can target more than 100 galaxies at once, this was such a slow endeavor that various kinds of selection still had to be applied to enrich the sample in higher-redshift systems. For example, one could target the reddest galaxies at a particular magnitude, since these will mostly consist of luminous elliptical galaxies. Donald Hamilton used this approach in the early 1980s to limit the amount of recent star formation in giant elliptical galaxies, since he found no change in the strength of the age-sensitive spectral break at 4000 A out to redshift z = 0.8. In retrospect, a few objects in that sample at z = 0.9 would have shown evidence for evolution, as later studies involving both optically- and radio-selected galaxies showed. These spectra of faint galaxies yield not only redshifts, but spectroscopic parameters which can be related to the age mix of the constituent stars and the amount of internal reddening (both of which are correlated with galaxy morphology in the local Universe). The sizes of samples available has risen dramatically with several kinds of technological development. The real breakthrough was multiobject spectroscopy— the ability to simultaneously measure spectra of objects scattered throughout a telescope's field of view. The most important implementation for faint objects has been multislit assemblies in the focal plane, where instead of the traditional single spectrograph slit, one incorporates a custom plate with a precision-machined set of slitlets whose locations will exactly match target galaxies when the telescope is properly pointed. The first such setups could observe perhaps 12-15 objects at once, with the spectra recorded on CCDs which were quite small by present standards. Richard Kron, David Koo, and collaborators used this approach with the 4-meter Mayall telescope on Kitt Peak to stretch the meaning of "long-term program'' beyond a decade, amassing a sample of 739 galaxy redshifts within four small fields, extending fainter than a red magnitude of 20. Similarly extensive surveys have been carried out by groups at the University of Hawaii, and the large collaboration known as the Canadian Network for Observational Cosmology. More recent additions, such as physically larger detectors with more pixels, multiple detectors, and setups with the spectra shorter than a detector side—so multiple spectra can be stacked in both dimensions—now allow a few hundred objects to be observed at once (see Figure 9.2 for part of such an observation) with the GMOS instrument at the 8-m Gemini telescopes (resulting, for example, in the Gemini Deep Deep Survey or GDDS, delivering high-quality spectra of numerous massive galaxies in a redshift range which is poorly probed by photometric estimates). Upgrades of the same kind at the Keck telescopes, with the DEIMOS spectrograph, are being made to support the DEEP 2 project which aims at measuring 50,000 redshifts for galaxies typically at z = 1, using about 85 slitlets at a time. ESO's Very Large Telescope can measure similar numbers per hour, and large faint-galaxy surveys have been carried out there as well. the CCD chip ("nod and shuffle") have been implemented to improve sky-subtraction limitations on faint-galaxy spectra. The results of these surveys so far give significant evidence as to how galaxies of various kinds have evolved. The distribution of redshifts seen to a particular limiting magnitude constrains the evolution of the sample in luminosity, once the sample selection is understood. The more strongly galaxies have faded with time, the more dramatically the redshift distribution becomes weighted to high values as soon as the sample goes deep enough to see galaxies in the initial luminous phases. If we have enough information to sort galaxies by type (either morphologically or by starformation history), this gives measures of their evolution in luminosity. Large enough samples can give more direct measures of how, for example, the star-formation rate has changed for galaxies at a fixed stellar mass (an important clue to the process of "downsizing"). These spectra also give us a nearly instantaneous measure of galaxies' evolution, through their rates of star formation as measured over several timescales. The emission lines from H11 regions, which can usually be distinguished from AGN phenomena, give the current rate of star formation as modified by any dust extinction, averaged over the short lifetimes of hot ionizing stars. Other features give longer averaging times, weighted in various ways. Balmer absorption is strong for stellar populations of ages 108-109 years, with H the last one to be clearly enhanced in a fading burst of star formation. The 4000-A break gives a very long-time average of the temperature mix of the stars, essentially telling when a galaxy ceased active star formation. This has been used to advantage for several sets of galaxies, showing a decrease in break amplitude for redshifts beyond about z = 0.9. Estimating formation ages, which in practice means the time since the dominant stellar population formed, exploits the leverage from lookback time. When we observe populations of galaxies progressively earlier in time, any substantial episodes of star formation become clear, even if their signatures have faded beyond distinction at the current epoch. This is especially valuable for elliptical galaxies, for which the 4000-A break amplitude is very well-behaved and systematic in our neighborhood. This tells us that the last significant star formation occurred at approximately the same cosmic epoch for most ellipticals. Measurements at redshifts closer to this epoch can clearly improve the precision with which we know when this happened, and whether the process was actually coeval for the whole class. Spectra can also show us when such galaxies have had a more recent burst of star formation, with two populations of quite different age coexisting. These have been termed "E + A'' or "K + A'' galaxies, from the combination of the typical spectrum of an elliptical galaxy (much like a K star) with the Balmer absorption from younger stars (as is strongest in single stars of spectral type A). These composite spectra (Figure 9.3) seem to be more common toward higher redshifts, perhaps indicating that the protracted star formation in many ellipticals was episodic. interesting that single-age models for the stellar populations will not fit this envelope for any simple cosmology (Figure 9.4), requiring that even elliptical galaxies still harbored significant star formation until nearly z = 1 (about 8 billion years ago for a typical cosmology). This time leverage also gives a powerful way to look for the galaxies which formed most of their stars at the earliest epochs, by finding galaxies which are reddest and have the strongest spectral breaks to yet higher redshifts. 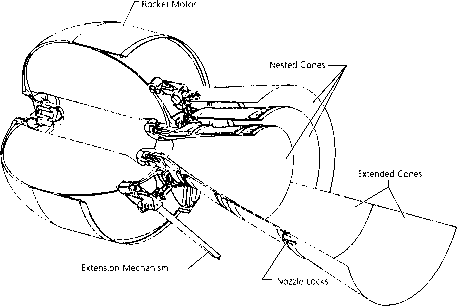 In fact, two such systems attracted attention for having implied stellar ages uncomfortably close to the estimated age of the Universe, as usual depending on cosmological parameters and details of stellar evolution. The radio galaxies 3C 65 at z = 1.1745 and 53W091 at z = 1.55 have derived ages for the stellar populations of 3.5-4 Gyr, sufficient to rule out certain combinations of H0 and q0 by themselves. Unless there is a problem with our understanding of their stellar populations, which do not appear to be in an unusual regime, these galaxies show that some elliptical systems completed their star formation, and probably assumed essentially their observed structures, very early and rapidly. This is particularly interesting in view of the distinct models for rapid, monolithic or slower, piecemeal galaxy formation, suggesting that some systems did form much as envisaged by Eggen, Lynden-Bell, and Sandage. Perhaps there really are two distinct ways and timescales for formation of elliptical galaxies. Figure 9.4. The 4000-A break as an indicator of galaxy evolution. The points show individual elliptical galaxies, both radio sources and radio-quiet ones, from surveys by Owen, Ledlow, Keel, and Hamilton. There is a clear envelope, such that the reddest galaxies at each redshift become systematically younger with redshift. This is in the general sense predicted for galaxies whose star formation is complete. The curves show the behavior of a 13-Gyr-old population for various values of the Hubble constant (for simplicity, with a flat cosmology in both cases). 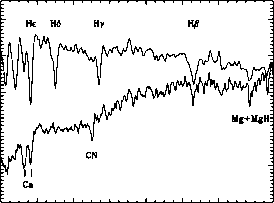 The greater observed slope suggests that many ellipticals had significant star formation until as late as z = 1. The very existence of an upper envelope constitutes a sign of galaxy evolution. one. The red sequence was also in place in dense environments by z = 1.5, albeit not quite as red as today since the stellar populations were younger. Much of the distinction between red and blue galaxies is traceable to total mass, another manifestation of the "downsizing" pattern. Massive galaxies must have formed quickly and likewise formed their stars quickly—so quickly that the classical monolithic-collapse scheme dating to Eggen, Lynden-Bell, and Sandage describes their bulk properties well. The narrowness of the red sequence also limits their development at later stages—any major mergers affecting most of the luminous red galaxies must have been "dry", lacking cool gas and resultant bursts of star formation. Although galaxies on the red sequence do not show active evolution driven by star formation in recent epochs, it is noteworthy that their aggregate stellar mass density increases between about z = 1.5 and now. This may be another indication that "dry mergers" continue to be important in galaxy assembly even when starbursts are not involved. Estimates of stellar mass in galaxies are now reasonably standardized, making results from various studies at least comparable. The same kind of broadband spectral fits which yield estimates of photometric redshifts also produce models for the stellar population and luminosity, and thus imply a stellar mass. Various algorithms may incorporate reddening using empirical or theoretical prescriptions. The greatest absolute uncertainties occur due to the amount of mass in low-mass stars which are very poorly represented in the integrated light, as well as to the possibility of heavily obscured star-forming populations which would be detected only deep into the infrared. Redshifts and spectroscopic properties of deep galaxy samples also contribute to our knowledge of the overall history of star formation, already encountered as the Madau diagram. The important quantities now are those that give some measure of recent star formation—intensity of emission lines from a galaxy's H ii regions or of the ultraviolet continuum from massive stars. These must be corrected for internal extinction due to each galaxy's dust, which becomes more important at shorter wavelengths and entails unavoidable uncertainties. Even with such corrections, in fact, the average star formation rate (say, per cubic megaparsec) is a lower limit, because sufficiently dusty star-forming regions will leave no observable trace in the ultraviolet. Just such obscured regions are important in some of the most active star-forming galaxies in the local Universe, which are strong far-infrared sources with only a small fraction of the light from their stars leaking out directly.